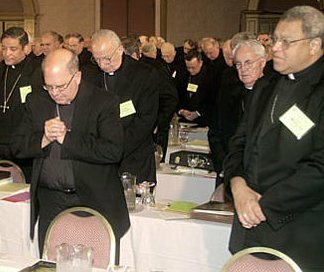 On this page we offer links to 1,634 articles about the crisis in the first half of 2003, including articles on the grand jury reports from New York and New Hampshire, a major settlement in Louisville, the arrest of Bishop O'Brien of Phoenix, the resignation of Governor Keating from the National Review Board, the meeting of the bishops in St. Louis (pictured here), the striking down of the Stogner decision, and many other topics. Click on those major stories, scroll down the page, or click to the month that interests you: January, February, March, April, May, and June. The articles on this page are part of a 7,123-article archive of news and commentary on the crisis, gathered by Kathy Shaw of Abuse Tracker and Goz Gosselin of VOTF-News. See our account of their important work, with Frequently Asked Questions about this feature. You may browse other portions of this archive by clicking on a month in the list below.